Elements of the charm offensive include the launch of a pro-Saudi Arabia media portal operated by high-profile Republican campaign consultants; a special English-language website devoted to putting a positive spin on the latest developments in the Yemen war; glitzy dinners with American political and business elites; and a non-stop push to sway reporters and policymakers. That has been accompanied by a spending spree on American lobbyists with ties to the Washington establishment. The Saudi Arabian Embassy, as we’ve reported, now retains the brother of Hillary Clinton’s campaign chairman, the leader of one of the largest Republican Super PACs in the country, and a law firm with deep ties to the Obama administration. One of Jeb Bush’s top fundraisers, Ignacio Sanchez, is also lobbying for the Saudi Kingdom. In September, the Kingdom helped sponsor opulent galas for Washington’s business elite at the Ritz Carlton and the Andrew Mellon Auditorium. The events were attended by King Salman, along with the chief executives of General Electric and Lockheed Martin, the chairman of Marriott International, and prominent think tank officials. So what do you do when you’re a barbaric monarchy with a justice system remarkably similar to ISIS, but at the same time want to remain very close ally of the U.S. government? You create a sophisticated propaganda network, naturally. This is precisely what the Kingdom of Saudi Arabia has done, and the Intercept’s Lee Fang shined some light into this very dark and slimy corner. 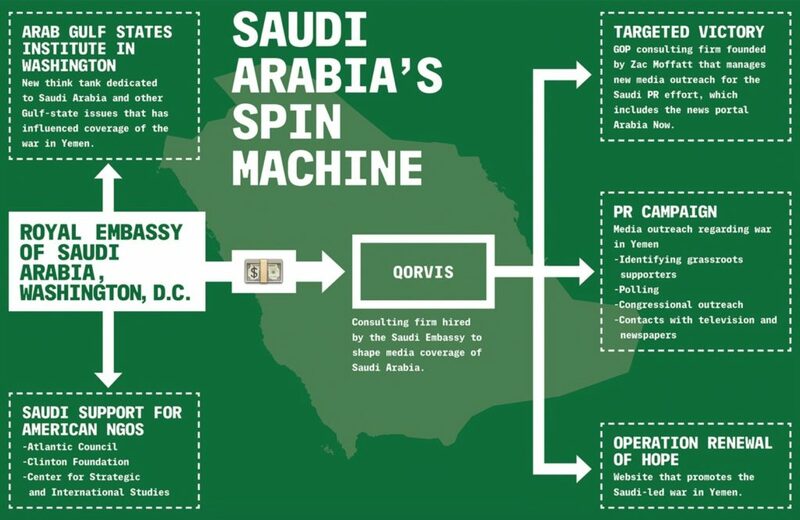 Soon after launching a brutal air and ground assault in Yemen, the Kingdom of Saudi Arabia began devoting significant resources to a sophisticated public relations blitz in Washington, D.C. The PR campaign is designed to maintain close ties with the U.S. even as the Saudi-led military incursion into the poorest Arab nation in the Middle East has killed nearly 6,000 people, almost half of them civilians. In what seems like a shameless lack of transparency, the New York Times ended the above mentioned op-ed with the byline below, failing to mention the fact that this think tank is fully funded by the Saudis and UAE, i.e., the fact that it was pure foreign propaganda printed by the New York Times. It should have read: “is a contributing opinion writer working on behalf of the governments of Saudi Arabia and the UAE,” but of course, it didn’t. Qorvis has contracted other firms to gauge public opinion, including Tuluna USA, an online survey company, and American Directions Group, a phone survey company founded by a pollster who previously worked for Bill Clinton. Perhaps not coincidentally, Saudi officials have regularly appeared on cable news programs and at Washington, D.C., think tank events to reassure American audiences that the Saudi-led campaign in Yemen is in U.S. interests. Here’s a user friendly graphic showing how some of this works.